Ron Sweed, also known by his late-night television host character "The Ghoul," has passed away according to reports from friends and his ex-wife Barbara J. King. Even though Spring is here, the ice on is still 12 inches thick on some inland lakes. 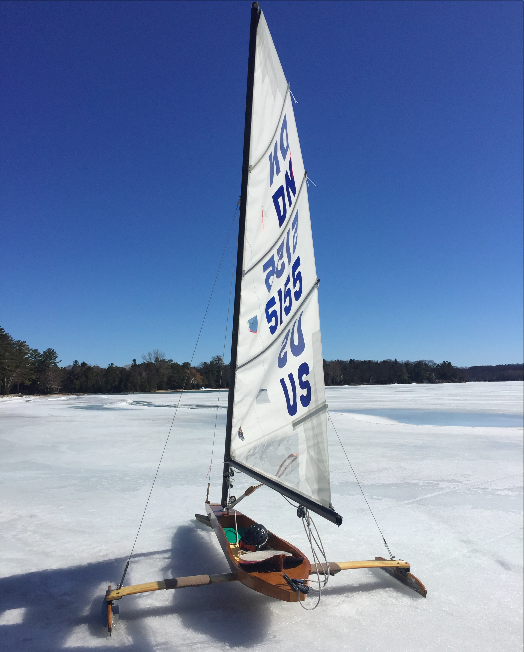 Because of this, you can see ice boats cruising along the ice on West Grand Traverse Bay or Lake Leelanau on a clear, windy day. The Toledo Christmas Weed is "what we all need this Christmas season"
Shades of A Charlie Brown Christmas are playing out on a busy intersection in West Toledo. The Toledo Christmas Weed, a lonely sapling growing out of a crack in the sidewalk, is now adorned with tinsel and surrounded by gifts. It even has a dedicated crew of Santa and his elves, one of whom was passing out free lottery tickets on Wednesday. Just off U.S. Highway 41 outside of Marquette, there’s an old man who lives alone in a small, one-bedroom house. Most days he's upstairs sitting at his desk or downstairs in his workshop. There he makes some of the best tobacco pipes in the world. “My name is Lee Erck. I am a tobacco-smoking pipe maker. I live here in Negaunee Township,” he says on a cloudy Friday afternoon. "Remember when you were a kid? Well, part of you still is. And that’s why we make Faygo," goes an old jingle for one of Detroit's most iconic companies. Faygo was born on Detroit’s Eastside more than 100 years ago, and it remains a well-known pop brand in the United States today. Joe Grimm is a journalism professor at Michigan State University and author of The Faygo Book. Even when the Detroit Lions lose, Michiganeers win with a great urban myth of Lions lore. As a long-suffering Lions fan, I've learned to appreciate the things they've taught. Things like the brief moment of hope before the season begins, or the benign satisfaction of a meaningless last second win after already being eliminated from the playoffs. The big winners in this weekend’s big lottery jackpot drawings may be Michigan retailers. About one and a half billion dollars is up for grabs in the Mega Millions and Powerball lotteries. Stateside's conversation with Mark Harvey, State Archivist with the Michigan History Center, and Frank Boles, Director of the Clarke Historical Library at Central Michigan University. For much of American history, newspapers were the main source of information for citizens of all backgrounds. And although profits may have been a top priority, newspapers helped form and inform communities, and provided a check on government. Stateside's conversation with Wendy Overbeck, senior horticultural manager at Frederik Meijer Gardens. It's a momentous week at the Frederik Meijer Gardens. Its once-tiny corpse flower is now a strapping plant, reaching several feet high, and it's about to bloom for the very first time. Stateside's conversation with Pranshu Bajpai, a security researcher working towards his PhD in Computer Science and Engineering at Michigan State University. Cryptocurrencies, like Bitcoin or the more than 1,500 other cryptocurrencies, are making some people rich. They're also opening up something new: your computer could be using its processor power, its memory, and your electricity to help make money for someone else. The process is called cryptojacking. Summertime in Michigan bring an endless variety of festivals to explore. Some, like the National Asparagus Festival in Oceana County, are pretty self-explanatory. Others, however, are a little more quirky. Take Sticky Buns Days, for example, which is happening this weekend in Grayling at Wellington Farm, USA. You probably know the basics of how a typewriter works – even if you have never used one. What you may not have known, however, is that the “father of the typewriter” was William Austin Burt, from Macomb County. As it happens, this Saturday is National Typewriter Day. Stateside invited Mark Harvey, state archivist with the Michigan History Center, to talk about what led to the birth of the typewriter.